"For those of us who like to make EVERYTHING ourselves -- an original wonton wrapper recipe. 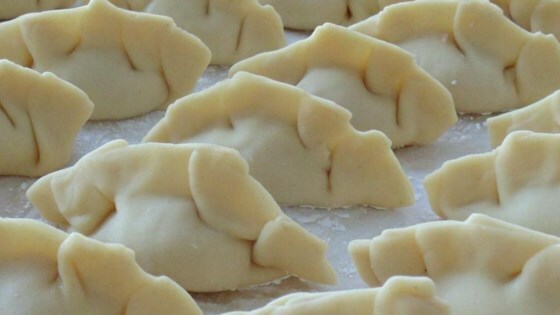 Use the wonton wrappers to form tasty little dumplings stuffed with your favorite fillings." In a large bowl, combine the flour and salt. Create a well in the center of the mixture and slowly pour in the egg and water. Mix well. If the mixture is too dry, increase the amount of water one teaspoon at a time until a pliable dough has formed. These turned out really good. Just make sure you roll them out REALLY thin, otherwise you won't get the crispy texture. They come out perfect. Just like my favorite Chinese restaurant.